We’d love your help. Let us know what’s wrong with this preview of David Golder, The Ball, Snow in Autumn, The Courilof Affair by Irène Némirovsky. Readers everywhere were introduced to the work of Irène Némirovsky through the publication of her long-lost masterpiece, Suite Française. But Suite Française was only the coda to the brief yet remarkably prolific career of this nearly forgotten, magnificent novelist. Here in one volume are four of Némirovsky’s other novels–all of them newly translated by the award-winning Readers everywhere were introduced to the work of Irène Némirovsky through the publication of her long-lost masterpiece, Suite Française. But Suite Française was only the coda to the brief yet remarkably prolific career of this nearly forgotten, magnificent novelist. Here in one volume are four of Némirovsky’s other novels–all of them newly translated by the award-winning Sandra Smith, and all, except DAVID GOLDER, available in English for the first time. DAVID GOLDER is the novel that established Néirovsky’s reputation in France in 1929 when she was twenty-six. It is a novel about greed and lonliness, the story of a self-made business man, once wealthy, now suffering a breakdown as he nears the lonely end of his life. THE COURILOF AFFAIR tells the story of a Russian revolutionary living out his last days–and his recollections of his first infamous assassination. Also included are two short, gemlike novels: THE BALL, a pointed exploration of adolescence and the obsession with status among the bourgeoisie; and SNOW IN AUTUMN, an evocative tale of White Russian émigrés in Paris after the Russian Revolution. Introduced by celebrated novelist Claire Messud, this collection of four spellbinding novels offers the same storytelling mastery, powerful clarity of language, and empathic grasp of human behavior that would give shape to Suite Française. To ask other readers questions about David Golder, The Ball, Snow in Autumn, The Courilof Affair, please sign up. Four beautiful short stories collected in a beautiful hardback edition. Almost all of them involve aspects of her own short life and while none are autobiographical, after reading all 4 you get a sense of her life through them all. The collections is grounded in her famous David Golder which catapulted her fame in early 20th century France, and the other 3 are just as good in their own way with The Courilof Affair as my favorite. In David Golder I got a sense of how Nemirovsky saw money and greet Four beautiful short stories collected in a beautiful hardback edition. Almost all of them involve aspects of her own short life and while none are autobiographical, after reading all 4 you get a sense of her life through them all. The collections is grounded in her famous David Golder which catapulted her fame in early 20th century France, and the other 3 are just as good in their own way with The Courilof Affair as my favorite. In David Golder I got a sense of how Nemirovsky saw money and greet corrupts ones life although I still really sympathize with Golder in the novel as he isn't the bad guy. She didn't hate capitalism by any means, she just was able to show how it can infect one's life and one's relationships. Showing these multi dimensions of Golder really solidifies it as her great first story. Great read! Iréne Nèmirovsky is quickly becoming one of my favorite writers. I was already in love with her last writing, Suite Française. Then I picked up her novella, Fire in the Blood, and enjoyed it also. Now, I’ve picked up a book of two novellas and two short stories: David Golder, The Ball, Snow in Autumn, and The Courilof Affair. Nèmirovsky was a Russian Jew whose family was forced out of her homeland by the Russian Revolution when Nèmirovsky was a child. The family moved to Paris where they blended Iréne Nèmirovsky is quickly becoming one of my favorite writers. I was already in love with her last writing, Suite Française. Then I picked up her novella, Fire in the Blood, and enjoyed it also. Now, I’ve picked up a book of two novellas and two short stories: David Golder, The Ball, Snow in Autumn, and The Courilof Affair. Nèmirovsky was a Russian Jew whose family was forced out of her homeland by the Russian Revolution when Nèmirovsky was a child. The family moved to Paris where they blended in with other Russian émigrés. Nèmirovsky started out by writing about life in Russia leading up to and during the revolution. As she grew as a writer, she noticed things happening in France. She included stories about Paris bourgeoisie and provincial living. Finally, she started writing fiction about French people reacting to the rise of Hitler and the fall of France to the Nazis. It’s probably a combination of her Jewish heritage and her writing that landed Nèmirovsky in a concentration camp, where she died of typhus. (Her husband went looking for her and was killed.) When the Nazis called Nèmirovsky, she went; willingly some people argued that she thought her relative fame in France would protect her. Given what she wrote about Hitler, that seems like a foolish, naïve belief—one I don’t think such a sensible and observant writer like Nèmirovsky could believe. It’s well known now that Nemirovsky sent her two young daughters off to Britian with her last writing hidden in their luggage. The stories were two of what was supposed to be five novellas that were to make up Suite Française. These two novels—not published until 2006—are beautiful little tomes about the fall of Paris to Germany and how the provincial people deal with billeting their German captors. Both stories are rich and fair and wry—their observations are amazing, their acceptance of human flaws is gentle and humorous. The Germans and French are both handled with equal, witty gentleness, as if Nèmirovsky loves all people—even supposed enemies—for their foibles. The earlier stories in this book show that Nemirovsky has talent, but they also show a writer still developing her craft. David Golder made her famous. It’s about a rich, old Russian Jewish man who is dying. He’s only lived for money and the love of his spoiled daughter; now that he is lonely, at the end of his days, he tries to secure the young girl’s fortune in hopes that the selfish teenager will think fondly of him after he’s gone. It’s a good story, but it—as well as The Ball—also has overtones of stereotype. The money-obsessed Jew, the shrewish wife, the child-jealous mother, the cruel Jewish child—they all make appearance in these stories. The Ball is about a newly rich Jewish family planning a ball. The mother hates her daughter, keeping the child from the party. So the child plots a mean revenge. Again, character traits that could be considered anti-Semitic show up. Is this slight discrimination possible, with Nemirovsky being Jewish? Yes; I believe she internalizes much of this, and it showed up later in her stories. She’s still capable of making interesting characters, at least of the leads. Her minor characters, though, do suffer from underdevelopment. Then I read Snow in Autumn, about a white Russian family escaping the Bolsheviks. The story is told through the eyes of their very devoted, ancient nanny. Here is where the author starts to show more of her gift for subtly. The tale of struggle and faith and loyalty is quite gorgeous. The nanny is a very honest, well-meaning old woman. The story is told in short chapters that often jump months, causing the reader to have to fill in some gaps, but it’s still a charming and erudite little tale. Then there is the amazing novella The Courilof Affair. Ah, what a great read! An old assassin reminisces about when he was hired by the Communists to kill Courilof, Czar Nicolas’ head of education. The young assassin wheedled his way into Courilof’s life, gaining the bureaucrat’s trust, taking residence in the man’s home. The killer starts to sympathize with his victim. He also learns through Courilof how people are selfish, protecting their own, putting others’ lives at risk for personal gain. It’s a gripping story balancing the gentleness of a loving marriage and honest friendships with the cruelty of human sacrifice and political terrorism. This novella is easily as good as Suite Française. It also shares that balanced, clever knowledge of humans and their weaknesses. The Courilof Affair would, in fact, make an excellent film. All in all, these writing give a sense of an already talented writer gaining her strength and voice. They show how Nèmirovsky moved away from two-dimensional writing to the sensitivity and sensibility she later became known for. It’s sad, because if her life hadn’t been cut short by some of the people she was being fair to, I’ve no doubt she would’ve been one of the great authors of the 20th century. In this book there are two stories of about 40-45 pages each and two short novels of about 120-130 pages. I ended up finishing only the two shorter stories. "The Ball": 3 stars for this one. It's about a French family who has recently had an upturn in fortune. The wife is desperate to be accepted into higher society and plans an elaborate ball. Her petulant and naughty teenage daughter ends up sabotaging the entire affair. As a result she discovers the power she can have over the adults in her li In this book there are two stories of about 40-45 pages each and two short novels of about 120-130 pages. I ended up finishing only the two shorter stories. "The Ball": 3 stars for this one. It's about a French family who has recently had an upturn in fortune. The wife is desperate to be accepted into higher society and plans an elaborate ball. Her petulant and naughty teenage daughter ends up sabotaging the entire affair. As a result she discovers the power she can have over the adults in her life, especially her mother. "Snow in Autumn": 4 stars for this one. This is rather grim and sorrowful, but that is its strength in this case. It's a very authentic-feeling story about an upper class Russian family around the time of WW I. They send their sons off to war, and ultimately have to leave behind their privileged lifestyle to flee the Bolsheviks. They go to Odessa and then to Marseilles and finally Paris, living in greatly reduced circumstances. The nanny, "Niania" who has raised two generations of the family's men plays an important role in the story as well, loyal to her employers through it all. Irene Nemirovsky's family had to leave Russia in a similar fashion, and I could detect the first-hand knowledge of the experience in this story. "David Golder": A great big "nyet!" on this one. Ugh! I hated it right from the start but gave it thirty pages in which to change my mind before abandoning it. 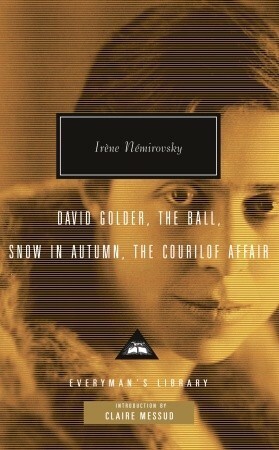 This collection of novels by Neminrovsky begins with her first published work in 1929, David Golder. In case you have forgotten, Nemirovsky died in Auschwitz in 1942 and sixty years later the novel she was working on, Suite Francaise, was found by her daughters and published for the first time. I enjoyed Nemirovsky's style and sad that she didn't get to finish her trilogy. When I found some of her other novels that made her quite popular during her life I wanted to read them too. I was not disapp This collection of novels by Neminrovsky begins with her first published work in 1929, David Golder. In case you have forgotten, Nemirovsky died in Auschwitz in 1942 and sixty years later the novel she was working on, Suite Francaise, was found by her daughters and published for the first time. I enjoyed Nemirovsky's style and sad that she didn't get to finish her trilogy. When I found some of her other novels that made her quite popular during her life I wanted to read them too. I was not disappointed. Nemirovsky is a master of telling a story and filling out her characters. It's no wonder that she chronicles the difficult period in Russian and European history that she lived in and so conseuqently these stories are not light and dreamy and sympathetic. They describe human nature and the feelings, desires and contradictions that lie behind our actions. I collect Everyman's Library classics and am always - always - on the hunt for them in used (and new) bookstores. After running across this edition in the Housing Works Bookstore Cafe in SoHo, my interest was piqued of course. After researching who Irene Nemirovsky was, I was instantly intrigued to learn more - and then I researched David Golder (the first of four novellas in this edition) and was hooked. Irene was of Ukrainian Jewish origin (Wikipedia) and died at the young age of 39 in Auschwi I collect Everyman's Library classics and am always - always - on the hunt for them in used (and new) bookstores. After running across this edition in the Housing Works Bookstore Cafe in SoHo, my interest was piqued of course. After researching who Irene Nemirovsky was, I was instantly intrigued to learn more - and then I researched David Golder (the first of four novellas in this edition) and was hooked. Irene was of Ukrainian Jewish origin (Wikipedia) and died at the young age of 39 in Auschwitz. The famous "Suite Francaise" was found decades after her death and published - a book that one can't not see in any bookstore across the country - and never once did I look at the back, notice the author. But now I know and Suite Francaise has been added to my list. I skipped David Golder because I couldn't take the Jewish stereotypes. Irene really has a lot of issues with her own people. My introduction to Nemirovsky. Some caustic, self-loathing views of Jews and adult women, yet fascinating for her view on Russian lives before, during, and after revolution. The writing is excellent, but these novels are too dark. After a while, the unrelenting grimness starts to wear on you. During her lifetime, Irene Nemirovsky was best known for two of the stories in this compendium: David Golder and The Courilof Affair. Since her death in 1942 in a concentration camp, she is known for the two stories published posthumously, Suite Francaise and Fire in the Blood, and for the biography (partially fictionalized) published by her daughter, Elisabeth Gille: The Mirador (Dreamed Memories of Irene Nemirovsky). 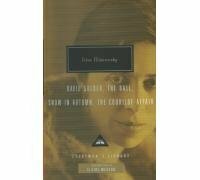 I find that her daughter's book gives me a good insight into her mother's com During her lifetime, Irene Nemirovsky was best known for two of the stories in this compendium: David Golder and The Courilof Affair. Since her death in 1942 in a concentration camp, she is known for the two stories published posthumously, Suite Francaise and Fire in the Blood, and for the biography (partially fictionalized) published by her daughter, Elisabeth Gille: The Mirador (Dreamed Memories of Irene Nemirovsky). I find that her daughter's book gives me a good insight into her mother's complex personality. Irene was born in Russia, the daughter of a wealthy, prominent banker, and a pampered, socialite mother. She witnessed the Russian Revolution first hand and was fortunate to escape to Finland and then to France. Her primary language was French, rather than Russian, and her wealthy background let her look down on the poor, including the poor and/or grasping Jews. Ironically, her Jewish heritage would result in her own death in France. David Golder appears to portray certain aspect of her own father and mother. The father has achieved great wealth but is a grasping, driven, ill old man, whose wife conducts affairs openly and, apparently, deceived her husband about the parentage of their only child, Joyce. Even when the deception is revealed, David Golder embarks on an arduous final journey to recover enough of his lost wealth to protect Joyce from a marriage to an equally old grasping rival. The descriptions are sometimes disturbing. Of David Golder himself, the author says: "His thick white hair used to be red, and a hint of that burning colour still remained at his temples and at the back of his neck, glowing like a flame half hidden beneath the ashes." She also makes a very offensive anti-semitic remark about David and one of his old friends: "Dirty and poor, all right, but does a Jew need much? Poverty preserves the Jews like brine preserves the herrings." That statement should be taken ironically but plays or played into the hands of the anti-Jewish forces who gathered in Germany and then in France in the 1930s. The authenticity of the characters in the story of David Golder makes this work highly compelling, and a fascinating glimpse into the maw of the Russian Revolution from someone who was there. The Courilof Affair is more directly involved in the early days of the Russian Revolution, circa 1903. Dissident students were sometimes shot during demonstrations and revolutionaries were launching terrorist attacks from Switzerland. The use of Switzerland by revolutionaries reminds me of Joseph Conrad's novel, Under Western Eyes. The author examines the personalities on both sides: of the young man, raised by his revolutionary mother, sent to assassinate the Minister of Education, and of Courilof, his intended target. The young man, posing as a doctor, lives with Courilof, who is dying of cancer, for several months, and absorbs too much of the older man's personality and reasoning. The assassin later reaches a similar level of power with the Bolsheviks, and carries out the same kind of reasoned but ruthless killings that occurred during the Czar's rule. Both the assassin and the minister learn that: "Power, the illusion of influencing human destiny, is as intoxicating as smoke, as wine. When you have none, you feel an astonishing sense of suffering, of painful uneasiness." Also, I am drawn to the statement" "True power lies in the hands of madmen or children, who don't even know they have it. The rest of humanity is chasing after the shadows!" According to the introduction, we are supposed to find David Golder the most impressive story and the others just slight affairs. I found it impossible to get interested in David Golder, but the others were - ok.
10/11: This novel is a lot darker than either of the other Nemirovsky novels I have read. The main character's heart is breaking--both physically through multiple heart attacks, and emotionally by losing his narcissistic daughter and wife, as well as his successful business. 9-27: Although the setting is quite different from Fire in the Blood, there are some similarities that are already revealing themselves. Will they turn into major themes throughout her work? Again, Nemirovsky chooses to use 10/11: This novel is a lot darker than either of the other Nemirovsky novels I have read. The main character's heart is breaking--both physically through multiple heart attacks, and emotionally by losing his narcissistic daughter and wife, as well as his successful business. 9-27: Although the setting is quite different from Fire in the Blood, there are some similarities that are already revealing themselves. Will they turn into major themes throughout her work? Again, Nemirovsky chooses to use a male narrator. Three has also already been a death in the novel, as there was in Fire in the Blood. The Ball is an outstanding short story about a young girls' revenge upon her socially climbing mother. It seems to encapsulate perfectly the Jeiwsh immigrant's desperation to become a part of the glittering Parisian society. Despite their wealth, the family know they are being mocked, still they strive to belong. Snow in Autumn is a deeper narrative that follows a loyal Russian maid as she endures the Revolution, murder, and poverty in Paris as the family flee to a safer place. Unbearably sad, sh The Ball is an outstanding short story about a young girls' revenge upon her socially climbing mother. It seems to encapsulate perfectly the Jeiwsh immigrant's desperation to become a part of the glittering Parisian society. Despite their wealth, the family know they are being mocked, still they strive to belong. David Golder was, to my mind a masterpiece. At it's heart is a man who knows he is dying. He has lost his friends, due to his own unscrupulous dealings in business. His wife and daughter view him as the bank that provides them with jewels, with a life style of luxury. Now, he has to reflect upon his life. I already read and reviewed David Golder so not gonna comment here. The Ball - the POV of this story is from this girl who longs to be a part of her mother attention and glitz and glamour. This story is about shifting of power. Of when you were a child and suddenly you realized your parents do not hold all the answers or wisdom and they are sometimes as childish as the child they are bringing up in the world. This is a wonderful short story. Snow in Autumn - A servant story on the collapse of he I already read and reviewed David Golder so not gonna comment here. Snow in Autumn - A servant story on the collapse of her master family in the Russian Revolution. I don't really like this story. Bit too depressing and it kinda goes on and on a bit without a point, but it was still very sad. The Courilof Affair - Is my favorite of it all. The story of its assasin and its victim. I love their relationship in this. Though I was a bit lost at first, but after the narrative became a bit clearer , the narrator and its victim, their relationship is beautiful and tragic. This is my book club's next book. Yep, that's right, I joined a book club. I'll let you know how this book is (if I can remember to buy it!). So far it's starting off a bit slow but there are 4 stories so maybe it's just this particular story. The anti-semitism in the book (which I was expecting because of the controversy surrounding Irene Nemirovsky as a self-hating Jew) is much more prevalent than I would have thought. Will keep you posted. Ok, I've finished the book (we meet to discuss it on T This is my book club's next book. Yep, that's right, I joined a book club. I'll let you know how this book is (if I can remember to buy it!). So far it's starting off a bit slow but there are 4 stories so maybe it's just this particular story. The anti-semitism in the book (which I was expecting because of the controversy surrounding Irene Nemirovsky as a self-hating Jew) is much more prevalent than I would have thought. Will keep you posted. Any novel that can take me from loathing the central character to grieving his unhappy end in less than 150 pages is a novel that I can embrace despite its shortcomings, mainly surrounding the author's stereotypical descriptions of the predominantly Jewish cast of characters. I think it's a little facile to describe Nemirovsky as anti-semitic. As I read David Golder I thought of contemporary Jewish artists such as Philip Roth or Woody Allen who use negative Jewish stereotypes, updated for late 20th century consumption, and are praised for their honesty about exploring Jewish identity or their own self-loathing. I think it is only fair to consider the same possibilities with Irene Nemirovsky, perhaps unconsciously on her part, but possible nonetheless. On par with Suite Francaise. Very well written short stories, excellent read. David Golder-memoir of a man who lives to make money and finds himself at the end of his life, alone. His last act, a business deal to secure the future of his daughter, the only other thing he loves besides making money. The Ball-a teenage daughter of nuveau riche parents, abused by her mother, exacts revenge, when her mother refuses to allow her to attend the parents 'coming out' ball. She throws the invitations into t On par with Suite Francaise. Very well written short stories, excellent read. The Ball-a teenage daughter of nuveau riche parents, abused by her mother, exacts revenge, when her mother refuses to allow her to attend the parents 'coming out' ball. She throws the invitations into the river. Sweet revenge! Snow in Autumn-story told in the person of a nanny to a family who flees their home in time of war and ends up in very reduced circumstances. I expected a charming collection of stories that shared the same flavor and storytelling style as Suite Francaise. Not! Did I like this book (admittedly I only read the first two stories while on vacation). I did like it! David Golder exposes a workaholic businessman warts and all and his relationship to a vain wife and spoiled daughter. I liked David Golder in the end and the story was on my mind for several days. The Ball explores a difficult relationship between a mother and daughter. The power I expected a charming collection of stories that shared the same flavor and storytelling style as Suite Francaise. Not! Did I like this book (admittedly I only read the first two stories while on vacation). I did like it! The Ball explores a difficult relationship between a mother and daughter. The powerless weilds some power in the end! I rehashed expisodes with my own mother for a few days. Reading these 4 pieces really fills out my understanding of Nemirovsky's writing. She works with characters that at first may seem mere stereotypes, but she gives us insight into those characters and their inner lives. I find it interesting that a woman so young could imagine the thoughts and motivations of such diverse characters and describe them in a way that rings so true. I usually prefer to read about characters who grow from their life encounters. These characters experience subtle change Reading these 4 pieces really fills out my understanding of Nemirovsky's writing. She works with characters that at first may seem mere stereotypes, but she gives us insight into those characters and their inner lives. I find it interesting that a woman so young could imagine the thoughts and motivations of such diverse characters and describe them in a way that rings so true. I usually prefer to read about characters who grow from their life encounters. These characters experience subtle change, coming to an understanding of their place in the small part of the world and of human history they inhabit. The subject of David Golder wasn't as interesting to me as Suite Francaise or Fire in the Blood, but it's a wonderful example of Nemirovsky's ability to so accurately portray the thoughts and feelings of a character. The Ball was fantastic! It's such a great example of a revenge story. The last line of the story was absolutely perfect. Snow in Autumn was okay but I think because I loved the Ball so much, I didn't like this one as much. Still interesting. The Courilof Affair was good. It dragged for The subject of David Golder wasn't as interesting to me as Suite Francaise or Fire in the Blood, but it's a wonderful example of Nemirovsky's ability to so accurately portray the thoughts and feelings of a character. The writing is so elegant yet the stories so depressing, particularly the deeply anti Semitic novella onDavid Golderwhich I found so cringe-worthy. There is so much talent here that I sought to read other books by the author who only has a few other books to enjoy. just read a short bio on the author's family and learned that her mother was extremely, vain, narcissistic, and emotionally distant. Irene doted on her father and spent most of her time engrossed in books and fled her mothe The writing is so elegant yet the stories so depressing, particularly the deeply anti Semitic novella onDavid Golderwhich I found so cringe-worthy. There is so much talent here that I sought to read other books by the author who only has a few other books to enjoy. In these four novels, as in Suite Francaise, Nemirovsky proves that she is a literary master, an artist. These stories were a more satisfying read than Fire in the Blood, which simply reminded me of Suite Francaise and made me want to read it again; they are different enough in setting and character, but her literary style is clearly established, and she shows her striking insight into a variety of characters. Beautiful. One of my absolute favorite things about Nemirovsky as an author is her ability to write a story in such a way that I can completely understand the inner workings of each character. Then suddenly when the story shifts to the perspective of another character who was not sympathetic previously she will tell the tale from their perspective and I'll completely understand and relate to that perspective. A really impressive ability to make the reader walk a mile in another's shoes. Irene Nemirovsky was unknown to contemporary readers until the publication of Suite Francaise, some 60 years after her arrest and tragic death at Auschwitz. I was pleased to discover she was already a successful writer for over a decade before her death, and her books are now available. The four short stories in this book are some of her earliest writings, and show her phenomenal talent as a writer...reminiscent of Somerset Maugham in my opinion. I plan to read all of her works. Irène Némirovsky (born February 11, 1903, Kiev, died August 17, 1942, Auschwitz, German Occupied Poland) was a Jewish novelist and biographer born in the Ukraine, who lived and worked in France.